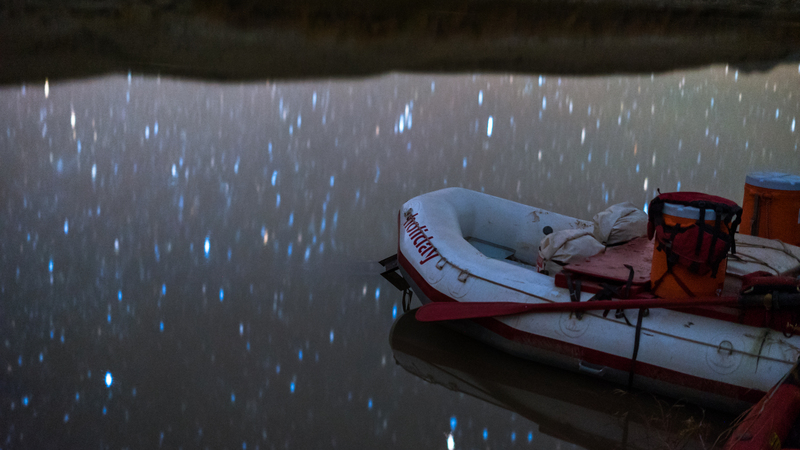 Holiday River Expeditions—a rafting and biking tour outfit in Utah—in partnership with Clark Planetarium, has been digging deeper into the questions of the night sky, and offering a series of “Stargazing” trips during every new moon of the summer months. The tour takes people into Canyonlands National Park, a designated International Dark Sky Place. Holiday River Expeditions staff member, Lauren Wood, is particularly aware of the deep significance of night sky experiences for humanity and writes thoughtfully about her love of the night. I spend my summers running rivers. Working with Holiday River Expeditions, I row long wooden oars, bake delicious treats in hot dutch ovens, construct sound tarp canopies on rainy days and sleep under the stars on cloudless nights. This lifestyle has gifted me with an intimate and persistent relationship with my greatest questions, often asked into the churning silence of my own head while staring at constellations and shooting stars. I grew up with this lifestyle as the norm, spending summers covered in sand on a bank of some river—the Green, the San Juan, the Yampa, the Colorado—making castles out of wet sands, carving images into mud, then watching them wash away by a rising shoreline. As a guide with Holiday, I am often heartened by guests on our trips having those same moments of awakening—realizations of interconnection and the vastness of the questions we have yet to answer. Because I have spent nights vibrating on rocks with the ecstatic realization that I am alive on this earth—in this galaxy, in this universe, and knowing that means something—I can see the same awe in others’ eyes. Holiday River has been digging deeper into the boundless questions of the night sky, and offering a series of “Stargazing” trips during every new moon of the summer months. We invite experts to join us, from the nerdiest of astro-wizes to world-renowned dark-sky experts, which gives us guides a chance to learn from those who share that deep connection. Getting a chance to marvel with each other about the wonders above our heads has been such a delight. River trips may offer the chance to run wild whitewater rapids or see incredible ancient dwellings, but more importantly, they offer a chance to connect with yourself. This profound sense of connection happens naturally when you have the space, time, and views of the middle of nowhere. I’d like to think staring at the dark sky makes us better people, each more grounded in our particular purpose in life. There isn’t hard science yet to prove that, it’s just my own experience. And even though we know so much more about the night sky than our ancestors, we still have so much to learn.